Though skeletal records are common, the footprint record of tyrannosaurs is surprisingly sparse. To date, there have only been a few isolated footprints found, and (until now) not a single reported pathway (i.e. multiple steps). Based on the limited evidence, many paleontologists surmised that tyrannosaurs operated as isolated creatures, hunting or scavenging alone for such prey animals as the Triceratops. Was Tyrannosaurus Rex a fearsome predator or just another scavenger? But now, at a remote location in eastern British Columbia, a team of paleontologists lead by Richard McCrea from the Peace Region Paleontology Research Centre have uncovered a set of tracks left behind by three tyrannosaurs moving in the same direction at the same time. It's considered the best evidence yet that these animals engaged in social behavior — and that they likely hunted in packs. What's more, it's the first record of the walking gait of tyrannosaurids. The first set of tracks were discovered back in 2011 when a hunting guide working in the area emailed McCrea some pictures. When he arrived at the site, McCrea found more footprints along the same trackway under volcanic ash. His team returned a year later and uncovered two more sets of tyrannosaur tracks running in the same direction. The preservation (depth of impression, lack of compression uplifts, evidence of skin impressions and striations) of the footprints in all three trackways suggests that they were made at approximately the same time, and increases the likelihood that these track-makers were associated. Tracks and trackways of smaller theropods and large ornithopods at this tracksite do not follow the same bearing as the tyrannosaurid trackways. In fact, the non-tyrannosaurid trackways are random in regards to compass bearing, which rules out a geographic barrier that might have compelled the tyrannosaurids to walk in the same direction and in close association. The inference that these three animals were moving as a social group is the most parsimonious interpretation based on current data and provides the first trackway evidence showing gregarious behaviour in tyrannosaurs. Remarkably, the footprints, which date back to nearly 70 million-years-ago, were so well preserved that even the contours of the skin were visible. Based on the size of the prints, the paleontologists place the dinosaurs' age somewhere between their late 20s and early 30s. Looking at the orientation of the tracks, it appears that the animals give each other adequate space; they were walking within a 28 foot (8.5 meter) corridor. The discovery also suggests that tyrannosaurs hunted together as pack animals, and it's here where some comparative evolutionary biology might be of some help. Clearly, there are many examples of extant apex predators who exhibit this sort of behavior, such as wolves and lions. Robert Bakker, a paleontologist with the Houston Museum of Natural Science who specializes in dinosaur behaviour, said that if the tyrannosaurs were fellow travellers then there's good reason to think they were part of a family group, not unlike a pride of lions on the Serengeti. "Top predators are the most quarrelsome cannibalistic category in the ecosystem," Dr. Bakker said. "It's impossible that these [tyrannosaurs] would clump together in a common cause unless they were sharing genes." It's also possible, of course, that the tracks were laid down hours or even days apart, but that would signify the presence of apex predators trundling along the same territory, which is less likely given the prospects for violent confrontation. The "family-group" theory seems more plausible. All this said, it's important to note that the evidence is very limited. The tracks represent just one stride, so it's difficult to make too many inferences. What's more, there are many rival explanations to the one proposed by McCrea, even if his is the most parsimonious. 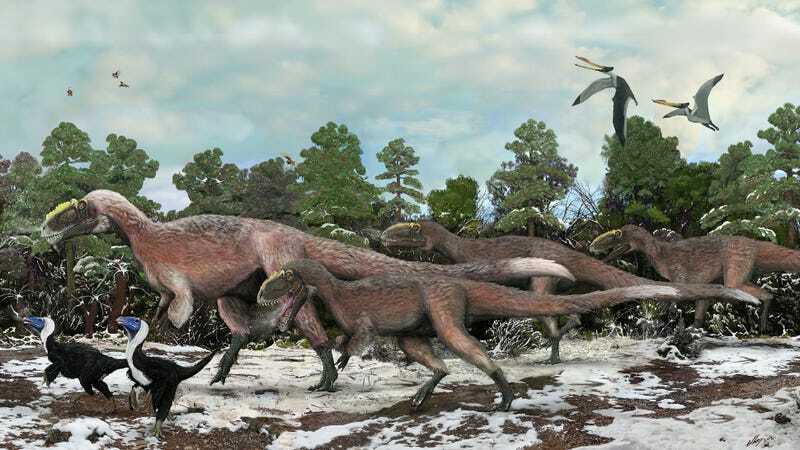 Read the entire study at PLOS ONE: "A 'Terror of Tyrannosaurs': The First Trackways of Tyrannosaurids and Evidence of Gregariousness and Pathology in Tyrannosauridae". Top image: Brian Choo; other images McCrea et. al./PLos One.